I’m kind of at the end of my blog now. I can think of maybe one or two more things I will write about and then I’ll be done. I’ve figured out that if you are happy in yourself, where and who you are, you don’t need to write things down so much. I’ll talk about that in my next post when I get around to writing it. That said, this is important. I put a guest post up by my late father a year or so ago. He was a natural story teller but not given to telling stories unfortunately. His brother was though. My Uncle Clark. He died over 14 years ago and this was something he had put together for his children, my cousins. They were just some memories he typed out on a few pages. I treasure my copy of it and I’m very proud to be able to share it with you. This is a fantastic snapshot of a simple life not so long ago in the far North of New Zealand. The life of my family. Please enjoy my Uncle Clark’s ‘Freedom Years’. It was that noisy dog of Paul’s that woke me up and I lay there listening to the barking fade away, as the truck sped to the back of the farm and turned over to the warmth of Kathleen’s back and hopefully to sleep before the dawn. No reason for Raina Puriri to be there in that half sleep but she was and Mrs Kaire and this one and that one, and soon I was back with the people of Pipiwai and Kaikou. They were all our friends and it was a pleasure to dream my way back down the Pipiwai Road again. Anyway as I drifted back down that slow dusty road, back among the old familiar homes and faces, sure enough a little niggley thing about our kids, started to get in the way. Why hadn’t I shared those freedom years of ours with them ? Dad certainly had with us. Russell and Tracy especially reckoned they didn’t know much about my childhood. Alright then (easy to make decisions half asleep), flushed with nostalgia, I’ll do it. I’ll write it down. I’ll start after breakfast. So here goes……. Strange that Raina should come back to me first. I doubt that I ever spoke to her, I’m sure I was in awe of her. I know she fascinated me. Why? Because she was so bright and lively and strong, when I was shy, and I envied her that. She was the only school child on the bus who could match wits with Dad and that took some doing. I knew there was something special about Raina. It wasn’t because Mum and Dad said she was going to go the Queen Victoria School then on to University, and end up being a leader of her people, I just knew. Sometime in the early 40’s Mum and Dad made a decision to leave the Bay of Plenty and look for a job in the north. It must have been our first trip in a train and it was marvellous, especially the overnight stop at Frankton Junction. I remember that so clearly as the hotel must have been alongside the station and I think I spent a lot of that night at the window, revelling in the sights and sounds of a bustling railway junction. Lights everywhere, the smell of cinders and steam, trains shunting and carriages crashing together and murmuring backwards and forwards along the platform. The sounds of American voices. Exciting, I’d seen Americans in the flicks at Opotiki but never any live ones and here were hundreds of them, American soldiers wandering past all night. We stayed with Aunt Una and Uncle Ned on their little farm at Kamo Springs for quite a while and then Dad got a job driving a bus and we were told we were going to live at a place called Pipiwai. So began our next great adventure – what would Pipiwai be like and how long would we stay there? Anyway, it wasn’t Pipiwai. We were to live at a little place called Kaikou five miles further on. That’s where the bus left from and that’s where our little corrugated iron house was. Iron lav out the back. Probably not more then 10-15 yards away, but on a dark winter’s night, and especially later on when our new Maori friends told us all about the “kehau” and their Maori spirits who inhabited the night, it seemed a 100 yards. I haven’t forgotten those desperate dashes out there, hoping the candle wouldn’t blow out with the speed of the gallop, slam the door shut and sit there in the flickering light trying to get on with it and at the same time keeping an eye on the dozens of enormous spiders glaring red-eyed from their webs. Anyway, we were pretty bright Ross and I, at five and seven years of age. It didn’t take us long to work out there is courage in numbers, and it was worth doing the dash together and putting up with the other’s lavatory habits and odours. Of course, if one wanted to go and the other didn’t, there’s a lot a heavy bargaining, deals and swaps, promises of anything, rather than take that solitary trip. Poor Toni, I don’t know how she got on. I’m sure we never volunteered our company! There was no power out there and no phone. Mum cooked on a wood stove and primuses and we used lamps and candles for lighting. Our one luxury was a large Zenith cabinet wireless operated by a 12 volt battery. There was no wash house for a few years until the house was enlarged. Mum washed our clothes down at the river. The house was very cold at night thanks to the corrugated iron and as Dad only had Sundays off he asked the local Maoris if we could get some firewood from behind the hall. They weren’t happy about him working on the Sabbath so we had to stay fireless until Mum thought of borrowing a horse and sledge from Billy Paraha. As Ross wasn’t yet at school, he had his first horse ride, and somehow they managed to coax the old thing up to the hall and back, returning with a load of whatever wood they could pick up. The house was set right on the road in a large treeless paddock of almost 30 acres, but rough with clumps of fern and blackberries. According to Mum, all she could see of us kids the day we moved in, was three blonde heads bobbing and weaving our way through this enormous paddock. She was scared that there may have been old bulls out there. It was a wild area but we loved it. Especially after Opotiki. There were some fearsome looking horned cattle, but we never worried about them so they ignored us too. The horses amazed Dad. He said he’d never seen so many white horses, and they were all over the place as the fences out there weren’t too good. Hardly anyone owned a car then but everyone had a horse, and how the passengers enjoyed it when the bus was escorted the last quarter mile to home, or the depot as they called it, by the local lads at full gallop on their horses, all done up like Tom Mix or Gene Autry in their Stetsons and chaps and spurs. After a tiring day in town, the passengers all enjoyed the spectacle of the horses racing the bus, but Dad wasn’t too happy as he was concerned they might kick up a stone and break the windscreen. I remember Dad and his bus run, but it was our bus run too, and we kids had to keep it clean. As long as it was dry enough on Sundays, Dad could drive it down through the paddocks to a stoney shallow spot where he could back right into the river and we’d all grab mops and buckets and rags and clean it inside and out. That bus was the lifeline of the district. It wasn’t just the only way most locals could get into town, it was their only way of getting their food, supplies and mail out too. So every afternoon Dad would be very busy loading the bus in the right order for all the stops along the road. The mail had to be sorted at the Post Office, rolled into individual bundles, tied with string and threaded onto a long piece of twine in the mail bag so that the mail for the first stop on the return trip was at the top of the bag. I used to enjoy helping with that when I was old enough, especially being his offsider in the school holidays. That meant sitting up the front with him and tearing out at the busier stops and popping the right articles in the right boxes, so as to save him getting out of the seat. Dad was very expert at the single boxes at the right hand side of the road. He’d slow up, lean out the window and have the mail in the box and the lid shut without even stopping. And he’d grind his way up through the gears again if someone shouted out…. “By corry Abbot, pretty good eh!”. There was always plenty of repartee on our bus. Plenty of laughter, especially when certain passengers got on. There’d be lots of cheek given and lots returned and everyone else would chuckle and smile. It always seemed to me a happy bus with Dad’s personality. He enjoyed welcoming people aboard and they enjoyed travelling with him. Toni and I went to the Te Horo Native School at Pipiwai for the first year, but from the next year on we all went to Purua. Dad would drop us off on the way to town and pick us up on the way back. Purua was a predominantly Pakeha school serving that farming community and I always wished I was back at Pipiwai. I think by the time I went to Purua, I was more Maori than Pakeha and my friends at Purua were mainly the few Maoris who went there: Wati Hauraki, Mathew Niha and the Kepa boys. Looking back, I think I related better to the Maoris because the Purua kids seemed so rich compared with our Maori friends and ourselves. They seemed to live in another world. Perhaps it was the first stirrings of a socialistic streak that ran in Mum’s family. (Uncle Lin was famous as Opotiki’s one and only Communist) but I didn’t think it was fair that they had so much and we had so little, So there was a fair sized chip on my shoulder that took a while to come to terms with, and I longed for the weekends and holidays when I could run wild at Kaikou. But there were a lot of good things at Purua. Mr and Mrs Buckland were marvellous teachers and they encouraged us to play all sports, even to the extent of walking the whole school about a mile across country to Don Finlayson’s creek for swimming lessons in the summer. By the time we arrived back at school, our legs would be carrying a sticky harvest of paspalum seeds. We each had a tiny vegetable garden to look after but my favourite lessons were the bushwalks where Mr Buckland made sure we all had an appreciation and knowledge of native trees. The practise they didn’t have at Purua, that we’d got used to at Te Horo, was the morning inspection for neatness and tidiness. Fingernails would be checked and then a small amount of salt would be put on our forefinger to clean our teeth with. Purua also didn’t have the beautiful Moetu Leonard. Moetu had been adopted by Mr and Mrs Cumpsty, the teachers at Te Horo, and she was a lot older than me – one of the big girls, but I thought she was lovely. I met her again a few years ago, and she is still a very handsome woman. Especially if we managed to talk Toni into making up numbers, and if she may have been a bit bossy within the last week or two. The horse manure played a part in us getting even again! Stockwhips were part of the scene out there so we had to imitate our elders and have whips too. We’d spend hours and hours selecting the right flax leaves, cutting them carefully to size and length, then using toes to hold the knot at the thickest end of the flax, start plaiting the four strips together. We would then find a nice piece of Titree or Lancewood for the handle. Then the secret to the sound of it – the cracker attached to one end of the four plait whip. This was made of flax laboriously scraped clean leaving only the fibre which was twisted and knotted into a whippy cracker about 18 inches long. We became really expert at making these while being expert at cracking them too. Another boyish interest in the properties of spit fascinated us for a while. There was big skeleton of a bullock dray on the side of the road opposite the house and we could spend a lot of Kaikou time seeing whose gob of spit could race the others down the slope of those enormous steel wheels. I do remember two marvellous rainy days. We used to spend hours planning. One was a marathon bicycle trip, when we didn’t have any bikes. The other was planning a nice house to live in. Dad probably set the seed for the bike trip with his constant stories about the wonderful Bay of Plenty and the larger than life people and families who lived there. Opotiki and Bay of Plenty became a Nirvana for us and the thought of pedalling into that fabled town dusty and dirty on our fantasy bikes, after weeks of toil and struggle really grabbed us and that pilgrimage was going to be our “Great Adventure”. From there on, every spare moment was spent pouring over our road map, sorting out which route to take and where we were going to camp every night. I’ve had a few bike trips since then, but never one as enjoyable as that. It was the dreaming that was the best part, and Mum always encouraged us to dream, She enjoyed dreaming about a better house to live in, and the planning that eventually went into the building of the little bach at Ngunguru she designed, rubbed off onto Toni and to a lesser extent, on me. That was a craze for a while, drawing out the floor plans of all sorts of exotic structures. One craze of Toni’s that Ross and I could never take to, was her passion for paper cut-out dolls. Her little cardboard dolls were the best dressed people in our house. Whenever the weather was right, we’d head for the river. That river was the centre of our universe. If we weren’t swimming in it, we’d be eeling or just generally fossicking around. We longed for a canoe. The house and lav were made out of corrugated iron, so why not make a corrugated iron canoe? We did. It sank. There were tennis courts at the Marae and as we got older, Mum and Dad suggested that if we picked enough blackberries and sold them in Whangarei we could earn enough to buy our own racquets. So we did. Many five gallon kerosene tins full later, we had our brand new racquets. The Marae was the social hub of Kaikou. All the Maori gatherings, Tangi’s, Hui’s, church services, and tennis days. Every now and then they’d hold a dance, and if Ces Wright’s band was playing, it would be a capacity house. Everyone turned up from babes in arms to Grandparents. We’d tear round all night slipping and sliding across the floor and if we were really lucky, Ces would do incredible things with his false teeth while waggling his ears just for us kids. But the day at the Marae I remember best, was the day the Abbot’s became part of Kaikou, part of the wild west society out there, and that was the day that Dad rode the wild bull at the annual rodeo. I think it started as a joke on the bus. A dare to see what the overweight Pakeha driver would look like on a horse. We hadn’t been there long and I don’t think the locals knew that Dad was a skilled horseman. It was the high point of the meeting. The locals had all turned up when they heard that Dad had entered for the bull ride, and when he eased himself onto that broad back, there was one big chuckle of anticipation, and after he rode it to a standstill, I think we passed into local legend. The trouble was he got all excited about his epic ride, and nothing would do but he had to turn us into rough-riders too. A couple of days later he managed to get a rope around one of the yearling calves that wandered near the house, and as I was the eldest, I had to have the first go. One big jump and I went straight over it’s head. It’s two little horns leaving two little grooves down my chest! As soon as Mum saw the damage, that was the end of our rough-riding careers. Some lovely music came out of the old hall. On quiet Sunday evenings as the church service ended, we could hear each family singing their way homewards. The Shortland family walked right past our bedroom window. We would poke our heads out and say hello and goodnight then back to bed and listen to that beautiful harmonising drifting into the distance as they walked that mile or so home. Dad just loved Maori music and I think it’s in my blood now too. Those beautiful sounds we grew up with are within me now, they are part of me. When I hear Maori’s singing together, I’m back again in Kaikou and there are two or three or twenty Maoris making magic music, and Dad revelling in it. Although we were country kids, we did enjoy a trip to town. We’d get dressed up. 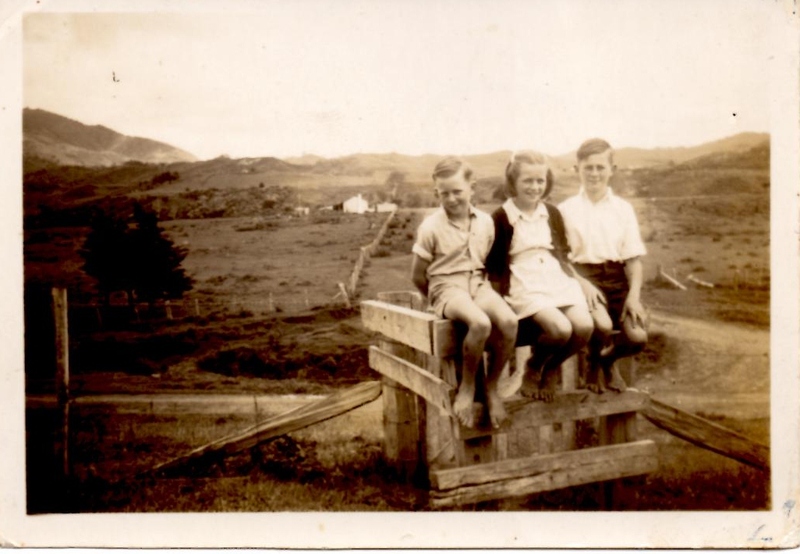 I remember Ross and I had Donegal Tweed coats and shorts. Toni has a sort of fitted and buttoned long coat, and Mum I remember best in a lovely deep red coat and hat and of course if we were going to see North Auckland play at Rugby Park, Dad would have his gabardine coat on and hat with a real rake to it. One of our greatest treats was to occasionally have lunch with Dad and his friends in a big restaurant in Rathbone Street. The waitresses would make a fuss of us and we would feel very grand. Then one day we found that a Fish and Chip shop had opened in James Street. You could stand at the window and actually see the whole delicious procedure. The sizzle of the chips as they sank beneath the boiling fat. Baskets of fish coming out boiling brown and the cook conducting it all – and the smells. From then on, that was our No. 1 attraction in Whangarei. Kaikou had nothing to match those boiling vats. The second-hand bookshops were where we stocked up on a new supply of comics, and Coutts the Chemists always had marvellous books to look through, until you got chased out. But it was the Chinese who lived in the house across the street from the bus depot who fascinated me. It was a very old house, front door opening right onto the footpath and these Chinese children would occasionally come out and sit on the doorstep, or scurry up the street on an errand. We never spoke. They would stay on their side of the street and we on ours – lets just stare!!!! I’d only read about them – inscrutable Chinese, and here they were, straight opposite the depot. Because Dad shared the bus depot with Karl and Isaac Erceg who operated the Matapouri bus, we started spending some of our summer holidays at Ngunguru. All we loved about the river at Kaikou was here but better. Sandy beaches, swimming and fishing where we could actually catch something. The old plank bridge over the small tidal stream was a marvellous spot for catching tommy cods and sprats. We could spend all day there. Then any there was the rope swing over the gigantic sand hill at Wellingtons Bay. The cricket matches we used to play in the evenings on the beach, and if we were lucky, Mum or Dad would hire one of the fleet of clinker-built dinghys on the foreshore and we could go for a row. We made friends with Chris Delaveaux and joined his gang and threw stones and insults at the Fulljames gang. The Delaveaux family fascinated me. Their French name hints at romantic ancestory. The parents were teachers, yet unlike any teachers I’d ever met – untidy and casual. The father looked like a beachcomber. The house had lots of paintings and they were just different. I decided they were artists and intellectuals, because I’d never met any, but I’d been reading about them. Chris’s older sisters Marie and Toni attracted too. They dressed differently, sort of gypsy-like. Yes I decided, they were definitely the most interesting family I’d ever met. Mum and Dad seemed to enjoy it down there too and when they could afford it they decided to build a bach and I remember Mum spending hours designing the plans. It was about this time that I was reading every book by Arthur Ransome I could get my hands on. “Swallows” and “Amazons” were my favourite. They were mostly about a family about our age, who had marvellous adventures messing about in boats. So I was ripe for some sort of adventure myself and the next time Mum gave us a shilling for an hours boat hire, I’d made up my mind I wanted to see how far up the Ngunguru River we could get with the tide. Toni and Ross were keen so off we headed. We took turns rowing and it was a marvellous day. I was hoping we could get as far as the Kiripaka Bridge, and eventually we made it. Late that afternoon we finally rowed back to a very worried Mum and Dad. I can’t remember the repercussions, I was on that much of a high, but I think it was a while before we were allowed out in a boat again. I do remember one very pleasant summer evening when the three of us sat up by the old quarry and serenaded Ngunguru at the top of our voices. It must have been our Kaikou musical background coming out in us. Within the next five years our lives changed forever. Ashley came along then Chris and we had two baby sisters to dote on. Then Mum read two books by Louis Bromfield – “Pleasant Valley” and “Malabar Farm”. We all loved those wonderful stories and within a couple of years the bach was sold, then the bus-run, and Mum and Dad bought their dream farm. I left barefooted childhood behind and entered gumbooted adolescence. We all have special memories of our childhood, but for me those simple days at Kaikou were my freedom years. Fantastic stories. RIP Uncle Clark. I’m not sure how many times I have read this, but each time, I cry. I was born in Pipiwai and remember well the Abbot name, and why shouldn’t I. When the Abbot’s went on holiday, my dad would drive the bus and I’m sure our family lived in luxury for a period when our whole family would move into the Abbot’s home in Kaikou and we would experience how the Pakeha lived and we kids would think we were in book heaven with all the books the Abbots had in their whare. My brothers, Charlie (Hare) & Bill Tipene and my sisters Molly Kairau Boyland and Ceda Margaret Wihongi Cowley still have vivid memories of this time in their lives, and remember the Abbot’s well. Last time I spoke with Hare, he told me many more things about the Abbot and Finlayson families. He was especially excited to tell me about what amazing Rugby players a couple of the boys were. They were even All Blacks, so they must have been great. Thank you, Sandy, for allowing us to access this beautiful record. Wish my parents were still alive to have read it. Thank you. Wan Wihongi Moynihan, Auckland.